Telephone World is a hobby website devoted to the mysterious device known as the Telephone. People have used "the phone" for more than 125 years, yet very few of us know what goes on behind the scenes when we make or receive a phone call. This website should help enlighten you on this useful yet mysterious device that is in most every home and business in the industrialized world. Background information on the history of the Telephone World website. Web pages devoted to events in telephone history. Recordings of telephone sounds and telephone recordings from the past to the present. Included are interesting, strange and unique sounds of telephone recordings from the past and telephone intercept recordings from the present. Pictures of telephones respresntative of various technologies and time periods. Western Electric and Automatic Electric telephones are represented here. Also see pictures from the Museum of Communications in Seattle, WA. Pictures and descriptions of pay telephones used in the US and Canada. Both telephone company pay phones as well as COCOT pay phones are listed. Also information on the former AT&T ACTS system is included. Have you ever wondered how your telephone is connected to other telephones? This section discusses the background and history of telephone switching systems - from the old Step by Step to modern digital and next-generation softswitch switching equipment. These cover both local central office switching systems and toll tandems. Have you ever wondered how your call goes through the telephone network? Descriptions on how calls go through the network along with signalling mechanisms are discussed. Our Telecom Related Links page lists a number of Telecom related websites - from the phone companies themselves to telecom equipment providers, and other websites that offer more in-depth information on the telephone. Pictures & information on (now former) North Pittsburgh Telephone Company, which was a small independent phone company located north of Pittsburgh, PA prior to 2008. UPDATED 11/24/2012 - News on the latest additions to the Telephone World website. Do you have questions? We may have answers. Is this what will happen to the desk telephone? 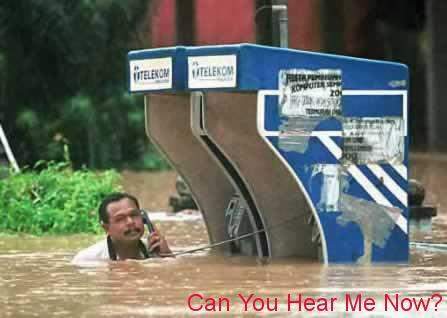 Sorry, I can't hear you. You sound like you're under water! This is a hobby website and it not owned by any telephone company.